‘Climate denier’ Lord Monckton surely couldn’t be citing ‘peer-reviewed’, ‘scientific’ or ’empirical government data’ in answer to these ‘cherry picked’ climate change myths ?! 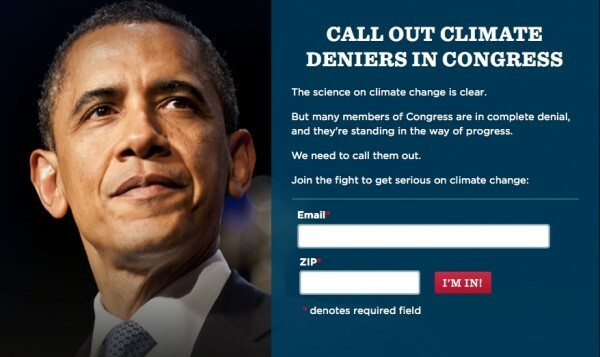 Even so, he is ‘not a scientist’ and he is obviously being ‘paid-off by the fossil fuel industry’ so it doesn’t count. 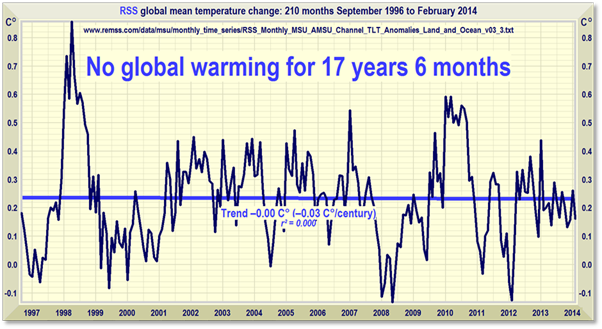 No: According to the RSS satellite record, there has been none for 17 years 10 months. 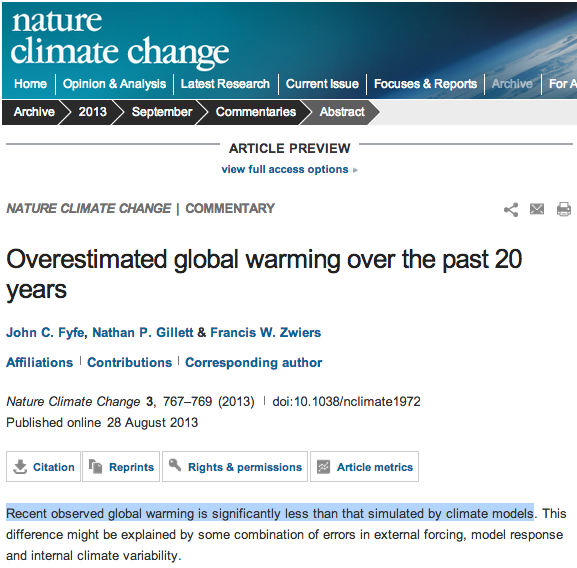 No: In 1990 the climate models predicted that global warming would happen twice as fast as it has. No: Only 0.5 percent of the authors of 11,944 scientific papers on climate and related topics over the past 21 years said they agreed that most of the warming since 1950 was man-made. No: A recent paper in the learned journals shows the fraction of the world’s land under drought has fallen for 30 years. No: The U.N.’s panel has said in two recent reports that there has been no particular change in the frequency or severity of floods worldwide. No: It has grown to a new record high in the Antarctic, though the Arctic icecap has been shrinking a little in summer. 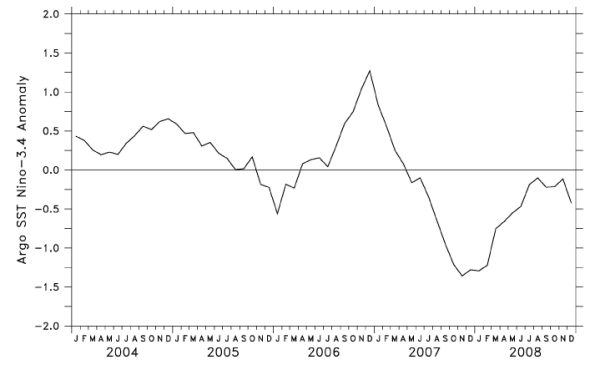 No: Some satellites show it as rising a little, while others show it as falling. No: Their combined frequency, severity and duration has been at or near the lowest in the 35-year satellite record. 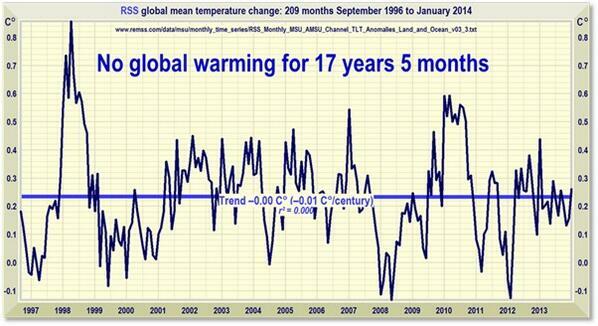 No: There has been no warming recently, so it cannot have caused any extreme weather in recent years. 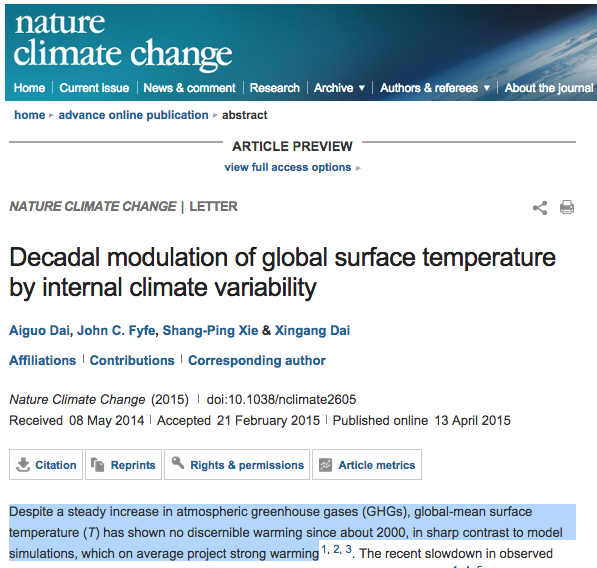 No: This is one of many scare stories about imaginary effects of warmer weather. No: The ocean remains decidedly alkaline, and there cannot be much change in its acid-base balance because it is buffered by the basalt rocks in which it lies. No: It is 10-100 times costlier to try to prevent global warming today than to let it happen and pay the cost of adapting to it the day after tomorrow. Memo to John Cook : There has been no atmospheric global warming, at all, over the past 17 years, despite 35% of all human CO2 emissions, since 1751, emitted over the same period. 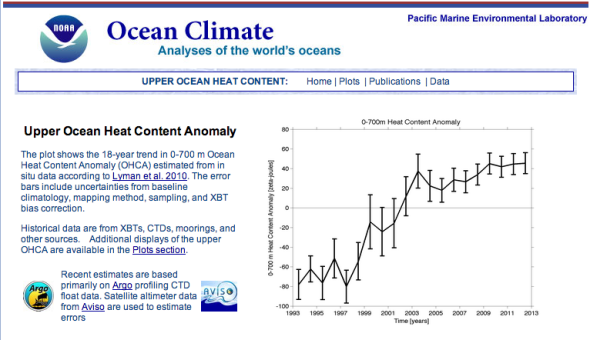 With no rise in atmospheric temps over the past 17 years, the latest bluff in climate alarmism is that the ‘missing heat’ is hiding at the bottom of the oceans. However, the first globally accurate network of measurement buoys (3000+ ARGO satellite buoys), which descend to depths of 2,000 metres, have detected no significant increase in ocean heat since deployment in 2003. 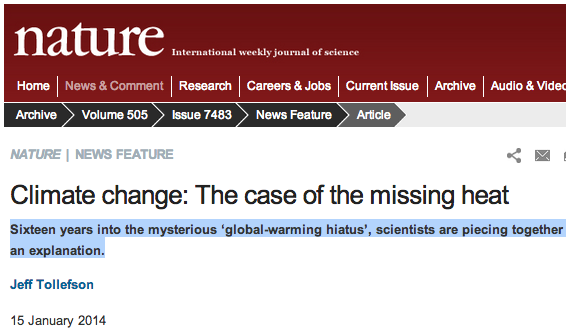 Another alarmist excuse for the 17+ year “pause” in Global Warming has been ‘scientifically’ assassinated …. 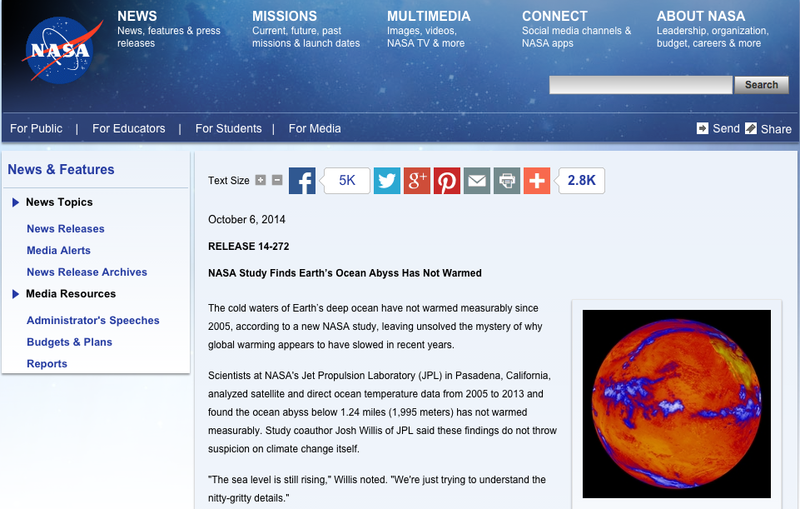 by none other than the doyens of ‘Global Warming’ hysteria ~ NASA, who now admit that the “Missing (atmospheric) heat” is NOT “Hiding in the deep oceans” after all ! October 6th, 2014 by Roy W. Spencer, Ph. D.
While still claiming that the results do not cast doubt on climate change, a new NASA press release says that the global oceans below 2,000 meters depth haven’t warmed since 2005. This is the period that we have had the deep oceans reasonably well sampled with thousands of globally-distributed Argo floats. Such statements have the usual vagueness that allows the True Believers to interpret it any way they want. 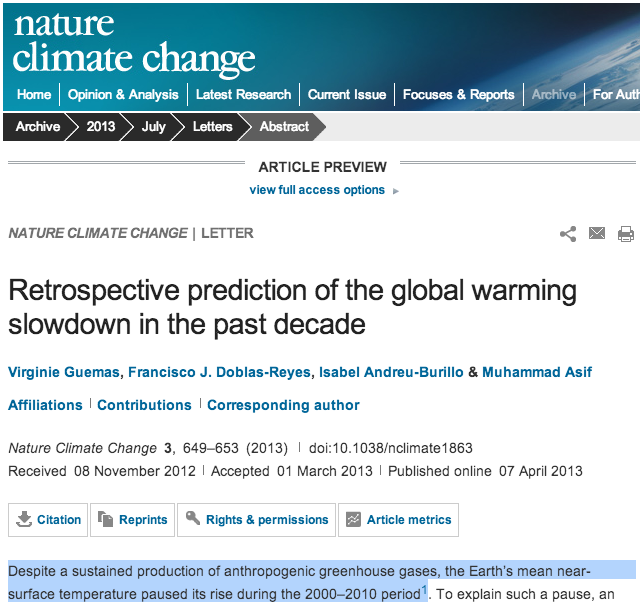 Does it mean: “It doesn’t throw suspicion on Al Gore’s impending thermogeddon”? Or does it mean: “It doesn’t throw suspicion on the fact that climate has always changed, and always will change, with or without the help of humans”? You see, as long as the IPCC gets away with basing alarmist rhetoric upon factually benign statements, like over half of the warming since the 1950s has been human induced (yawn), the global warming debate will remain dominated by extremists. And this allows politicians to get away with saying whatever they want. Scientists are so vague that their statements can be used in a wide variety of ways that help the politician. From the well-established scientific fact that there has been no global warming, at all, for the past 17 years, it’s not hard to see why Cook and the global warming climate change cult believe the debate “needs to become more political, and less scientific”. 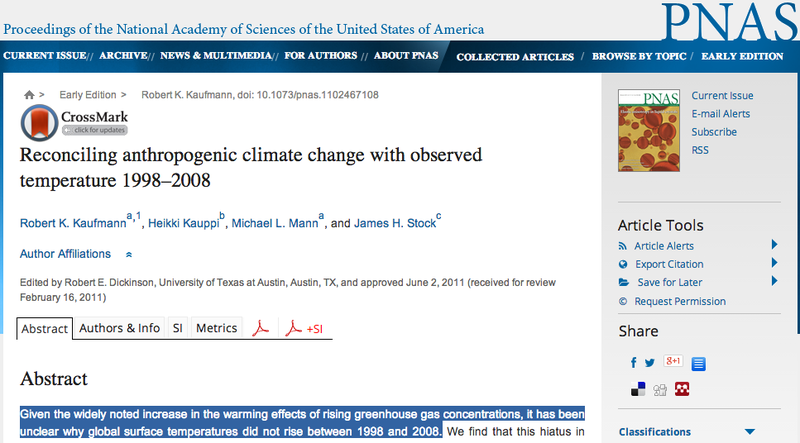 Global Warming was never about ‘science‘. It was always about Power, Money and Overpopulation. 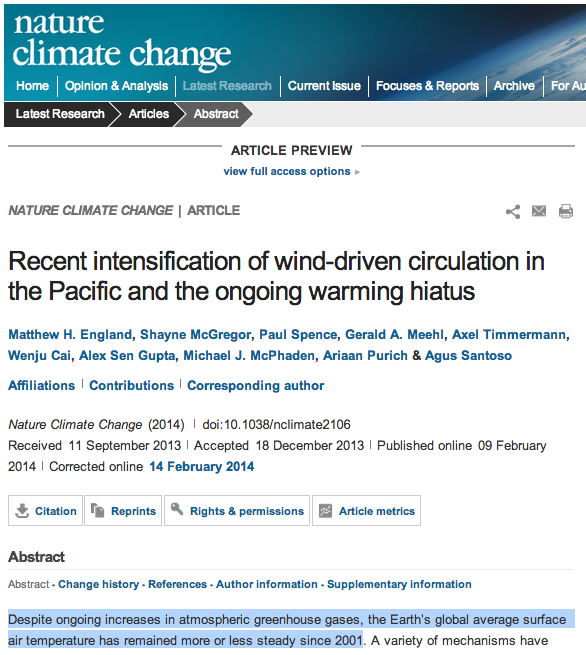 El Niño or ñot, the Pause lengthens again | Watts Up With That? 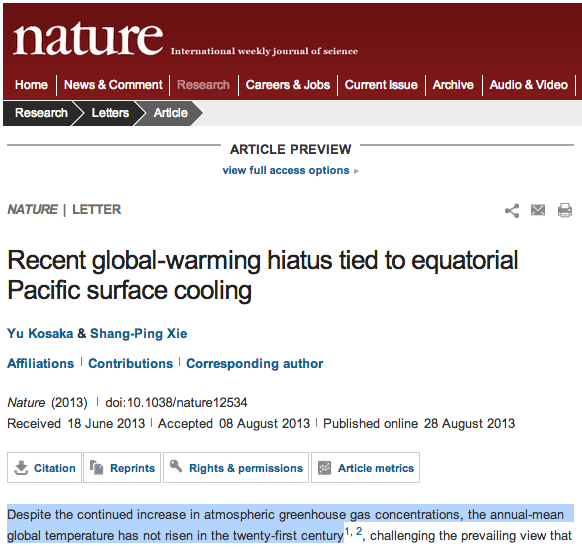 Cook’s 97% climate consensus paper crumbles upon examination | Watts Up With That? Cooks ’97% consensus’ disproven by a new peer reviewed paper showing major math errors | Watts Up With That? 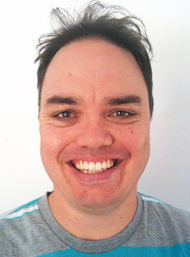 Skeptical Science’s John Cook – Making **** Up | Watts Up With That? Stephan Lewandowsky and John Cook – making things up | Watts Up With That? 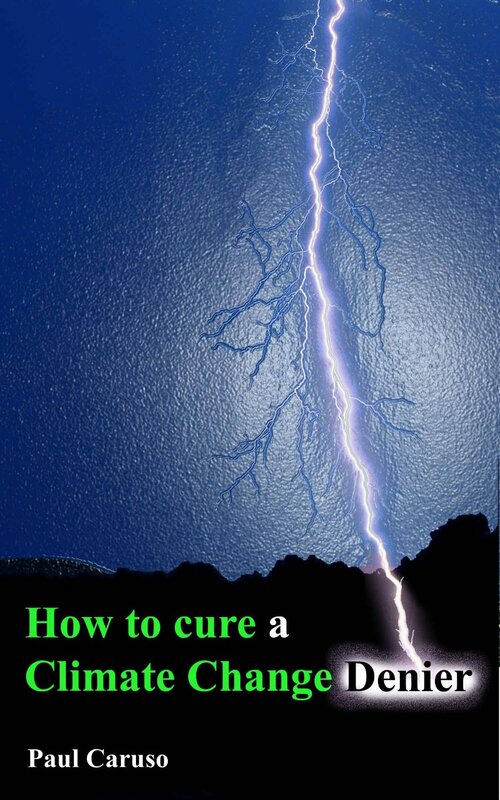 Skeptical Science takes ‘creepy’ to a whole new level | Watts Up With That? Getting ‘Cooked’ by Hiroshima Atomic Bomb Global Warming | Watts Up With That? Wood for Trees is a graphing site which allows you to plot out temperature data sets, among other things. Apparently actual data is biased towards deniers, which gives the site a bad reputation among alarmists. Paul Caruso once lived in an off-grid eco-community, grew much of his own food and was an active member of Greenpeace. However, over the past few years he has lost his faith in human induced climate change and become a denier! 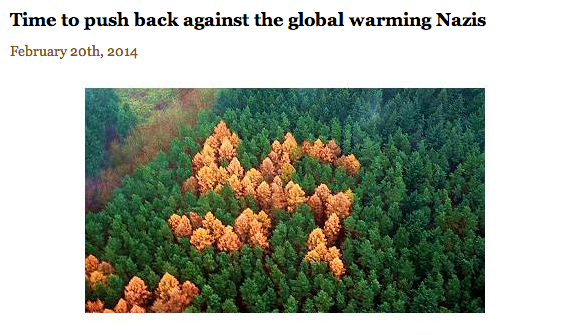 He doesn’t really deny that the climate is changing – he has just come to the conclusion that it is natural variation.